Results of round table "Postal services for business: the situation in Ukraine"
News / cases / Results of round table "Postal services for business: the situation in Ukraine"
On July 17th, 2012 a round table "Postal services for business: the situation in Ukraine" was held in Interfax-Ukraine news agency in Kiev. 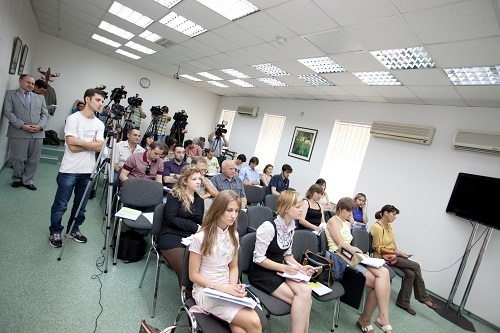 On July 17th, 2012 a round table "Postal services for business: the situation in Ukraine" was held in Interfax-Ukraine news agency in Kiev. Industry experts discussed ways of solving problems related to safety and reliability of postal services, talked about the methods production modernization, answered the journalist’s questions and voiced the current situation on market. Speakers of the event were: Vladimir Astapenko, deputy director of Kyiv City Directorate USEPC "Ukrposhta", Lyudmila Silantyeva, Head of "Ukrainian postal service" Company (UPS), Irina Sidorchenko, Head of Customer Service "Edipresse-Ukraine", and Elena Petina, Head of UPS Commercial Department. According to experts, the structure of postal services industry has changed a lot in the last time. New segments and services that have a major influence on quality of service, both for legal persons and public, appear now. During the roundtable, Vladimir Astapenko, deputy director of Kyiv City Directorate USEPC "Ukrposhta", also told about importance of cooperation Ukrposhta and commercial postal services. The result of partnership between Ukrposhta and "Ukrainian postal service" Company was creation of a unique postal service center, which allows much faster and better serve commercial organizations. For example, in 2011 a personal post office was opened on UPS production area, and from June 2012 Workshop on servicing corporate clients of Ukrposhta was established. Ukrposhta office and packaging workshops work closely and can remove any arising problems and difficulties in the field. According to USEPC "Ukrposhta" more than 9.00 million letters and 2 million packages was sent through the post office №72 in almost a year. As a result of successful agency work 27 journalists from news agencies, specialized and business editions and also five TV channels visited round table.